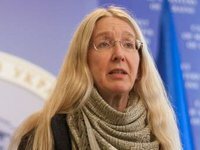 Eight people have died of complications arising from measles in Ukraine, acting Ukrainian Health Minister Ulana Suprun said during government hour at the Verkhovna Rada on Friday. "Another measles death was reported yesterday. The child was not inoculated. This is the eighth [death] since the beginning of the outbreak," Suprun said. Ukraine has seen 1,285 measles cases among children and adults since the beginning of this year. "As many as 1,285 children and adults fell ill over the first two weeks of 2018," Suprun said.